Description: AN ABSOLUTE MUST SEE HOME IN KENILWORTH! SPACIOUS AND UPDATED MOVE-IN READY. FANTASTIC LOCATION! 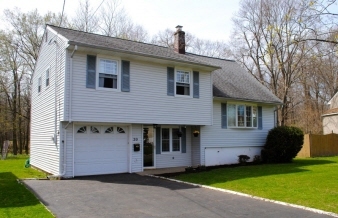 Quite tree lined street, in a highly desirable neighborhood near the Cranford border. Convenient to - everything: town, schools, parks, shopping NYC transportation! This special home boasts: 3 bedrooms, 1 full bath, 1 half bath. The open floor plan is a perfect layout for comfortable living. This one of a kind home features: a foyer entry, freshly painted rooms, hardwood floors, formal living room, formal dining room, eat-in kitchen, updated main bath, family room, powder room, recreation room, utility/ storage room, walk up attic,attached one car garage and so much more! The tranquil park-like backyard has access to walking trails and is perfect for outdoor relaxing or entertaining. Make it your new home today! "My Clients Dreams Become a Reality. Trust My Experience"